Weekend snow likely. Nuisance for Philly; plowable for Shore? 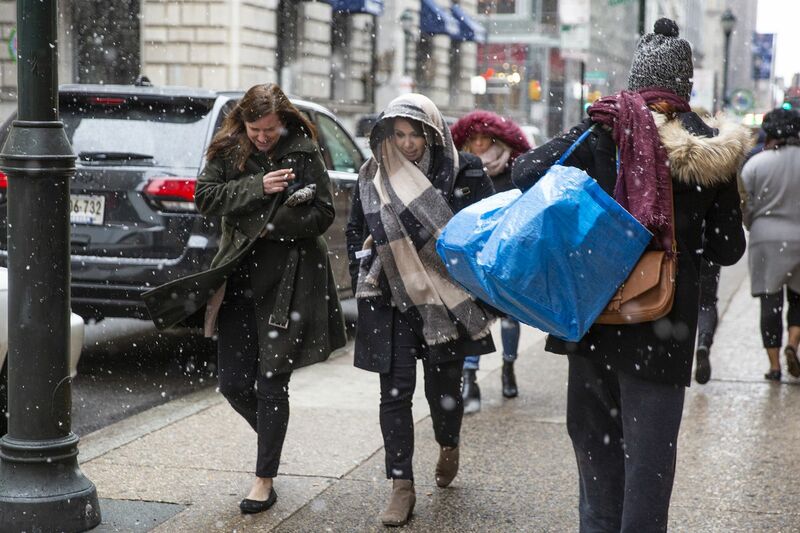 Pedestrians walk along 15th street as snow falls in Philadelphia on Wednesday, Dec. 05, 2018. Watching computer-model forecasts in the run-up to a snow threat is not unlike watching the fluctuation of a stock price — and sometimes about as useful. But after some quite predictable vacillation, the general agreement is that the region will see snow Saturday night and possibly Sunday, with a nuisance one to three inches around Philly and more at the New Jersey Shore. And that’s the latest call from AccuWeather. “We’re close enough in. We have to take a stand one way or the other,” meteorologist Dave Dombek said Thursday, adding that the one inch is more likely than the three. The computers are taking the main storm well to the south of the region and out to sea, and it’s possible that not a flake falls from the Lehigh Valley north. Still, even a marginally measurable snow could have a measurable impact, said Dombek, given that the region hasn’t had a significant snowfall since mid-November. A more significant snowfall is possible at the Shore and in southern Delaware, where up to four inches could accumulate, and the “lollipop” zone of heaviest snow for now is targeting the Washington area. “For now” is a caveat, because although the models are in “not too bad agreement,” in the words of the National Weather Service office in Mount Holly, they have been known to change course on the threshold of an event. “To me, the most accurate snowfall model run is the one about 24 hours prior to onset,” which would be late Friday, Tony Gigi, a retired Weather Service meteorologist, posted on the phillywx.com site Thursday. “Every run before this time is window shopping without making a purchase,” he said.